Thanks a lot to all who have attended the first karatepraxis seminar in Toffen (CH). That was an amazing weekend with great people…. and beautiful landscape. Saturday morning we started with a separate kids class. We worked out grappling, distances for kicks in partnerwork and some focus-mitts techniques. After that the Saturday adult class started and trained over the day. We covered full Bunkai to Tekki / Naihanchi Shodan, parts of Heian / Pinan Nidan, Yondan and Sandan and had exciting fun with the pads. On Sunday morning, right after timeshift, we started again and with even more people in the dojo. We worked on full Heian / Pinan Shodan Bunkai and principles. Developed a drill out of it and worked it out. We also did parts of Bassai-Dai Bunkai on the ground, Empi and Jion Bunkai combinations. That was a great weekend with more than 50 participants! Thanks for being there. We’re gonna have a good day! At Karatepraxis we do consider Kata as the book of tricks for our martial art. From our point of view every motion in Kata has got a defending or attacking character. This video shows the application of the first few techniques in the Kata Empi. This sequence contains several important application and fighting rules. Starting with: Leave the line of fire, hikite-hands are for pulling, open hands are for grabbing and last but not least: (body-logic) means paying attention to the expected physical reaction after a Strike or a kick. We do believe that every Kata is a complete defending and fighting system. All we need to do is to take a closer look! This video was filmed on my recent seminar which I taught with my friend Ludwig Binder in March 2019 in Hameln. We covered kata Bunkai from Shotokan and Ten-Kyo-Ryu. The last session of the day was planed for pad-combinations. This is what the video is about. Enjoy watching, like, leave a comment and subscribe to our karatepraxis channel. Karatepraxis Seminar in Toffen is soon to start. We spent the past two days in Zurich and on the Uetliberg, in Thun and in Bern. This is such a beautiful country with nice people. Can’t wait to start training with others who love karate. Next weekend I’ll be teaching my first ever Karatepraxis-Seminar in Switzerland. I look very much forward to it. The 2-Day-Seminar will take place in Toffen on the 30th and 31th of March 2019. Since there is only room for 60 places it is recommended to register soon. Unsere Lehrgangsorte kannst du hier auf einem Blick auf Google Maps finden. 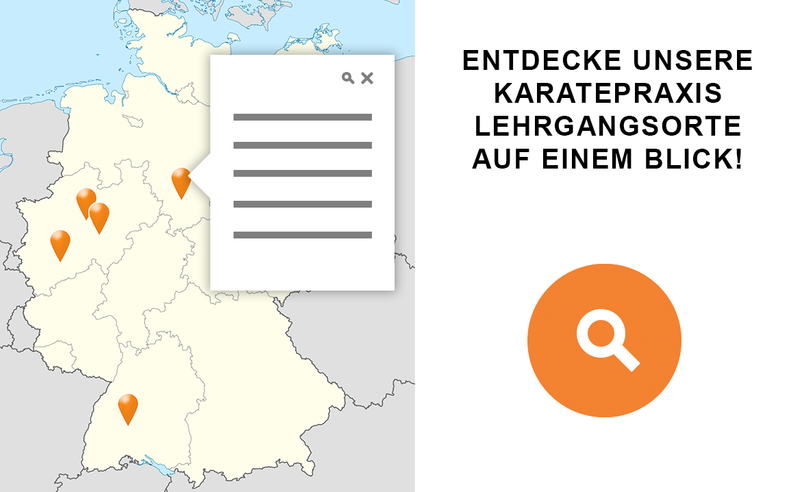 Durch Klicken auf einen Pin in deiner Umgebung erfährst du, wann der nächste KARATEPRAXIS Lehrgang dort stattfindet.